Describing the Principle: When the air-fuel ratio is at 14.7 to 1, on a gasoline engine, (stoichiometric ratio) conditions are ideal for complete combustion. Complete combustion helps to ignite the air-fuel mixture, ensuring release of all the heat energy in the fuel. If combustion is complete, very little unburned fuel is left. If combustion is incomplete, (either learner or richer) various pollutants are produced. There are three primary pollutants caused by poor combustion. These include carbon monoxide (CO), hydrocarbons (HC), and nitrogen oxides (NOx). Each of these pollutants is shown on the illustration to the left. The center vertical line represents a 14.7 to 1 air fuel ratio. Left of this line means the engine is running richer. Right of this line means the engine is running leaner. The curves show the pollutants produced with both the richer and leaner mixtures. 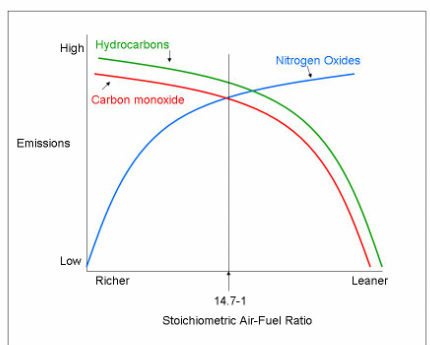 For example, the leaner the air-fuel ratio, the more NOx being produced. The richer the mixture, the more CO and HC being produced. It can be seen from this chart that the closer the air fuel-ratio is to 14.7 to 1, the less pollution that is being produced.